South Carolina law requires those wishing to sell motor vehicles in the state to obtain a license before doing so. 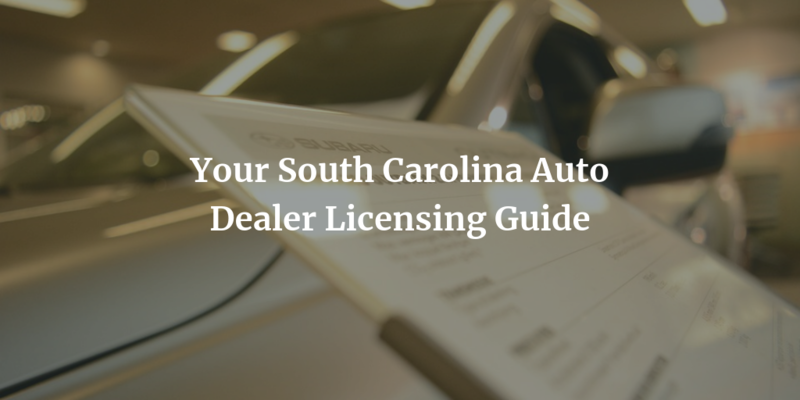 Getting licensed is a fairly straightforward process but involves passing a pre-licensing course, passing a criminal background check, as well as submitting a South Carolina auto dealer bond. Read about the whole process and requirements below! While the application process is fairly similar for these licenses, there are some minor differences. This article will focus on the application process for motor vehicles dealer licenses, and motor vehicles wholesaler licenses. Make sure to check the DMV website for more information regarding getting other types of licenses. Both types of dealer also require garage liability insurance coverage if they intend to apply for a dealer demonstration plate. If your license application is approved, you will be notified and will be asked to pay $50 to get your license. Licenses are valid for 12 months after they have been issued and must be renewed prior to their expiration date. See the renewal page for more information regarding the renewal of your license. First-time applicants may not know what bonds are or how they work. A surety bond is a financial security agreement that provides guarantees to dealers’ clients that dealers will comply with state laws. If a dealer violates the laws by, for example, lying to their clients and thereby causing losses to them, a claim can be filed against their dealer bond. When a claim is filed, the surety investigates the issue and may compensate claimants up to as much as the full amount of the bond. This bond is in the amount of $30,000 – the total amount of compensation a surety may extend to one or several claimants. If a surety covers a bond claim, the bonded dealer must reimburse the surety in full. That is how bond agreements work. Bond amount and bond cost are not the same, however! The cost of getting bonded is equal to only a small percentage of the total bond amount. Your personal credit score plays a major part in determining the bond rate you are offered by the surety. The higher your credit score is, the cheaper it will be to get bonded. Applicants who have a credit score of 700 FICO or more can expect a rate between .75%-1.5% on their bond. So, if you are offered a 1% rate on your bond, you will need to pay $300 to get bonded! Complete our bond application form and we will provide you with an exact quote on your bond! Requesting a quote is free of charge!